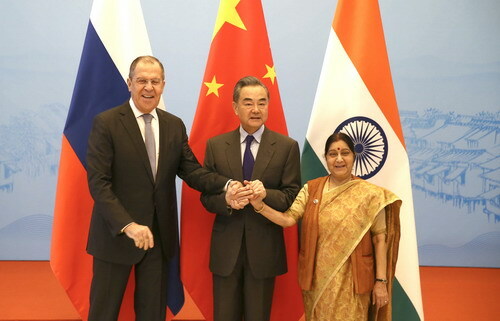 On February 27, 2019, State Councilor and Foreign Minister Wang Yi, Foreign Minister Sergey Lavrov of Russia and External Affairs Minister Sushma Swaraj of India co-held the 16th meeting of the Foreign Ministers of China, Russia and India in Wuzhen of Zhejiang Province. Wang Yi chaired the meeting. Wang Yi expressed that the current world is undergoing profound changes unseen in a century, and the international community has a major choice to make between opening up and isolation, between cooperation and confrontation, and between win-win results and monopolization. At this important moment, China, Russia and India, as major countries with global influence and main emerging economies, should conform to the aspirations of most countries, shoulder due responsibilities, strengthen coordination, build consensus, enhance cooperation, and jointly promote world peace and stability, in a bid to inject positive energy into human development and progress and open up new prospects. Wang Yi pointed out that the leaders of China, Russia and India successfully held a meeting last November, which charted the course and provided strong impetus for cooperation among the three countries. The meeting of the Foreign Ministers this time is to implement the consensus of the leaders and promote the in-depth and practical development of trilateral cooperation. Under the current international landscape, the three countries should firmly safeguard the international system with the United Nations (UN) as the core, adhere to the principle of non-interference in other's internal affairs, deepen counter-terrorism and security cooperation, and jointly safeguard world peace and stability. The three countries should resolutely oppose unilateralism and protectionism, continue to push forward trade and investment liberalization and facilitation, and promote the construction of an open world economy. 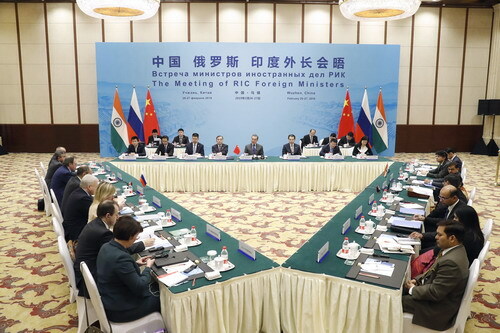 China, Russia and India have all proposed their initiatives of connectivity, and they should strengthen cooperation among one another, form a joint force and jointly promote the development of the regional integration process. Foreign Minister Sergey Lavrov of Russia and External Affairs Minister Sushma Swaraj of India said that the international community should comply with the purposes and principles of the UN Charter, abide by international law and the norms governing international relations, and safeguard global and regional peace and stability. The leaders of Russia, India and China held an informal meeting in Argentina, providing political guidance for cooperation among the three countries. In the face of the complex and evolving international situation, the three countries should make use of such multilateral platforms as the UN, the G20, the BRICS cooperation and the Shanghai Cooperation Organization to further strengthen coordination and cooperation in the fields covering peace, security and economic development, and jointly make positive contributions to properly handling international and regional hotspot issues and tackling all kinds of challenges facing humanity. After the meeting, the three countries released a joint communique.